Windscribe is a decent VPN service that offers a free subscription as well as a premium plan with extended features. Despite the fact that it has one of the best logging policies we’ve seen (especially for a free VPN service), it falls short in other aspects. If some of its drawbacks made you consider a different provider, you’ll be glad to know that there are plenty of good VPNs around. 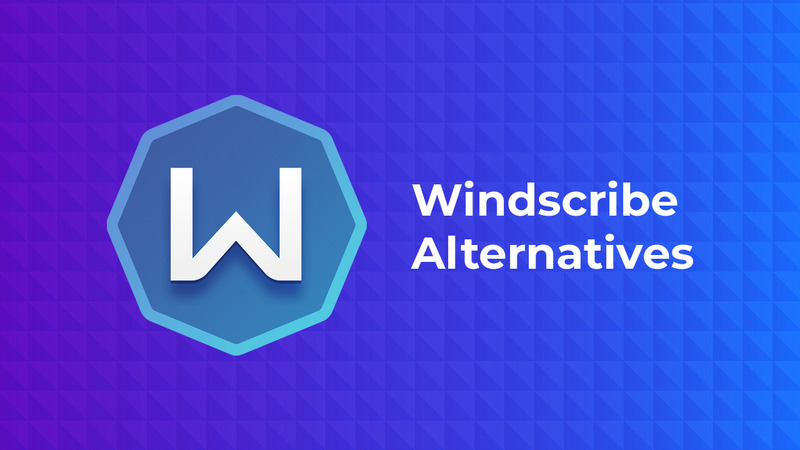 In our post, we reveal the best Windscribe alternatives to improve your online experience and security. Why Look for Windscribe Alternatives? Windscribe is a VPN on a budget with solid AES-256 encryption and OpenVPN protocol included into both free and premium subscriptions. Its software has a very user-friendly interface and some nice features such as malware protection. That being said, the service is far from being perfect. Sluggish speeds are one of the most serious problems of free VPNs. Unfortunately, it affects Windscribe as well. It offers just a dozen of servers to the free subscribers so no wonder that they are overcrowded and, as a result, very slow. The paid version includes around 500 servers in 60 countries but still, this is not enough to maintain a fast connection. Moreover, sometimes their advertised servers go down and you won’t be able to access them. It is no doubt a shortcoming considering mediocre coverage in the first place. Many Windscribe clients are concerned about their security. Windscribe doesn’t collect extensive logs and this is great. However, the company’s headquarter is located in Toronto, Canada. The country is a member of infamous the Five Eyes alliance and security-conscious users worry that Windscribe may be forced to spy on its clients. Another weak point is tech support carried out through email tickets and AI chatbot named Garry. While customer support via bots is better than no support at all, you may often face issues only real people can help with. But there is no live chat and this is frustrating if you need immediate assistance. Along with that, you would probably want to get a whole package of other features such as torrenting support, ability to bypass geo-restrictions on Netflix, Hulu and other video-on-demand platforms, strong security, easy-to-use apps, etc. While having all these useful features, you’d surely like affordable pricing. Not only does NordVPN benefit from a favorable jurisdiction in Panama but also boasts a comprehensive zero-logging policy. Together with military-grade encryption and the latest connection protocols, it creates one of the best user protection services in the industry. You are also able to take advantage of extra security features for advanced users such as Double VPN, and even Onion over VPN. Your identity is protected even if a VPN connection fails thanks to Kill Switch feature. NordVPN has the largest network comprised of 5,500+ servers and covering 60 countries. The speeds throughout the network are fast but you might experience some noticeable drops when connecting to remote server locations. The service allows torrenting on all servers with no exception and every one of them has built-in DDoS protection. Its online tech support works pretty fast and is available through apps and the official website. Speaking of apps, you can configure NordVPN client on pretty much every internet-compatible device. NordVPN offers excellent value for money. We recommend its long-duration plans with discounts of up to 75%. You can test the service risk-free thanks to a 30-day money back guarantee. ExpressVPN is another great alternative to Windscribe. The service is a little pricey but it’s worth every cent. ExpressVPN is rightly considered to be the fastest VPN provider. The service has configured its network to ensure the best performance as well as ultra-fast and consistent speeds. You can connect to any of its 3,000 servers and enjoy hassle-free video streaming, gaming, or torrenting. The service is a spot on choice for security paranoid users. It is registered in the British Virgin Islands, an offshore country with beneficial security legislation. It doesn’t cooperate with any intelligence alliance either so you can rest assured that nobody is going to monitor your activities. ExpressVPN itself is not able to provide data on users’ browsing history because it doesn’t keep traffic logs on its servers. This is an ultra secure provider with best in class encryption, private DNS servers, Kill Switch, and a bunch of other useful features. IPVanish is based in the USA. Despite the fact that the country is the Five Eyes founder, you shouldn’t worry about your privacy. The service doesn’t monitor user traffic and it means that intelligence agencies won’t be able to record it either. When enabling IPVanish on your device, you’ll keep all hackers and cybercriminals away thanks to unbreakable encryption with a strong 256-bit key AES cipher. IPVanish is a great option for the whole family. It allows using 10 devices at the same time for various activities. Torrenting, gaming, and video streaming have never been easier and safer with IPVanish. Its apps are super easy to use and whenever you require assistance, various options to get in touch with the support team are always at hand (including 24/7 live chat, email ticket, and even phone support). More than 1,200 servers in 48 countries comprise IPVanish’s network. You can also use SOCKS5 proxy servers for anonymous browsing without compromising on connection speed. IPVanish is a great online security service for user on a budget. For the lowest price, we advise getting its annual plan with a 46% discount. There are many free providers you can use instead of Windscribe such as ZenMate, TunnelBear, Hotspot Shield, etc. However, each of them has common drawbacks – slow speeds, limited access to server locations, data caps, ads-infested and buggy apps, and many other problems. They are no help if you are a torrent enthusiast or an avid gamer. Streaming platforms such as Netflix, Amazon Prime Video easily detect and blacklist their servers IP addresses making it impossible to access your account. But the biggest problem with free VPNs is weak security. They keep traffic logs and sometimes, they even allow third party companies to insert tracking codes onto clients’ devices. The bottom line is that there are no free VPNs to become a good alternative to Windscribe. We appreciate Windscribe’s no identifying logs policy, generous 10 GB data with the free subscription, and convenient apps. However, this is not enough to become a premier service. For such reasons as slow connection speed, average customer support, and a small server network many users seek the best Windsribe alternative. As a replacement service, we recommend one of the trustworthy VPN providers with an impeccable reputation, uncompromising protection, as well as feature-packed and convenient apps. Free services, sadly, are no-go in regard to your security and user experience.